Air Bed and (maybe) Breakfast. 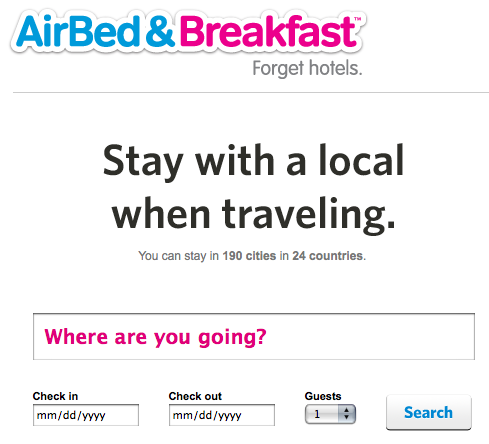 AirbedAndBreakfast is a new take on the finding-a-hotel-at-the-last-minute problem. You’ll probably pay one fourth of the price of a hotel… money that can be well spent on other necessities such as wine and cheese. And it might just be that you have more fun staying with a local than in a lonely hotel room. Isn’t meeting people what traveling is all about after all? And, if you’re at a conference, it’s good to get in to ‘networking’ mode right from home! The website is amazingly simple to use – whether you’re searching for a bed, or whether you’re posting your own advert. If you can’t explain your business model in 3 simple steps like the above, you’re probably building yourself a house of cards. Unless you’re uber confident of your financial genius that is.